I’m super excited to start this new art journaling project. For too long, I have wanted to fit journaling into my schedule; to put time away and to do nothing but delicious journaling! So, finally I did it! Challenge accepted!! 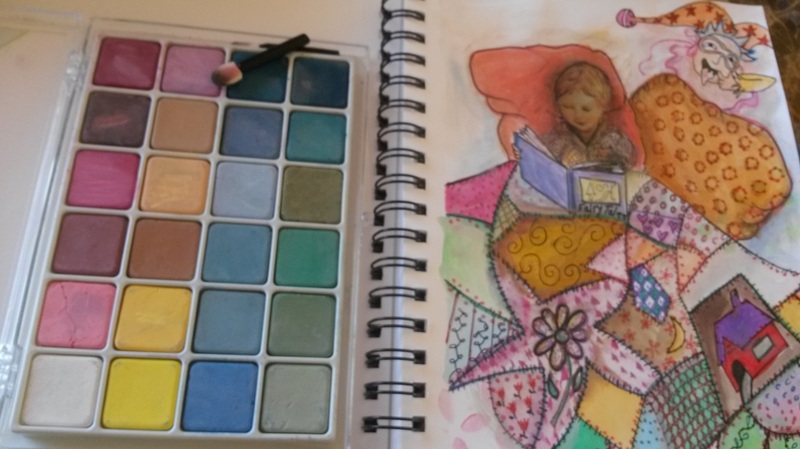 I will be incorporating and using Art psychotherapy with this Art Journal project. Art psychotherapy offers a process of interaction between our longing for expression in our lives and the parts of our psyche that feel needy, hurt and afraid. Each journal page will focus on self-expression therapy along with self-love and acceptance therapy. You are the expert on your inner world and I will use creative techniques such as collage, writing exercises, intuitive painting, Zentangle, and other creative mediums to invoke your inner child; so you can discover parts of your inner life that may feel neglected, and uncover what you are unconsciously negatively creating so that you can make new choices and decisions about how you want to move forward in your life. 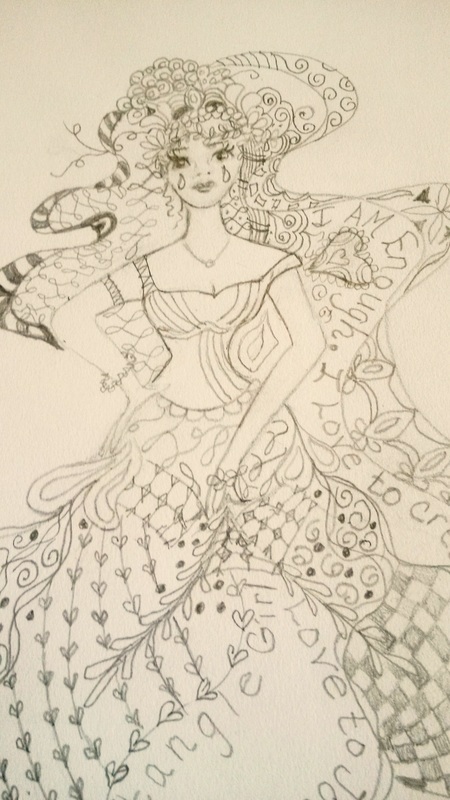 I used Zentangle patterns in creating my sense of self journal page. 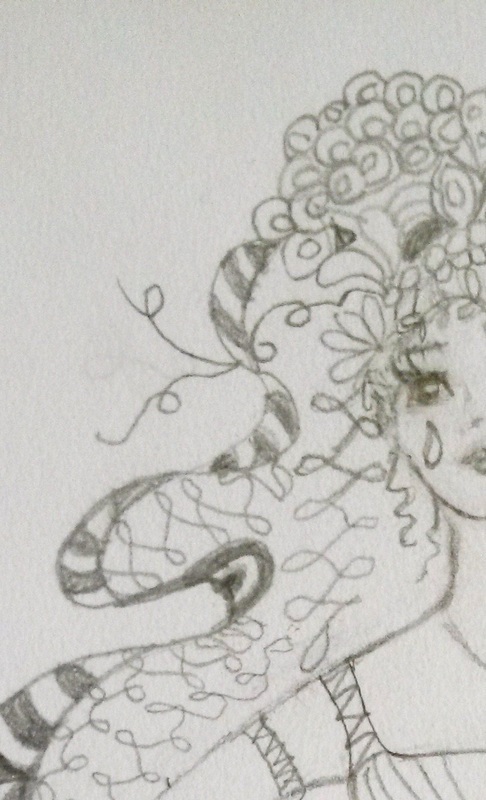 To find out more about Zentangle click here for Zentangle Method. I created this drawing from unconscious intuition and feeling. I didn't worry about it being perfect or proportionate, I just started drawing repetitive simple designs. I added my favorite positive affirmation. You can write in anything that defines or identifies your sense of self. This exercise was super relaxing and therapeutic. What is sense of self? Everyone has a sense of personal identify. How do you think about yourself? What is important to you? Identities are often imposed or at the very least encouraged by environmental or cultural forces. As a child, were you routinely told, “You are smart,” You can draw well,” or “You can’t do anything right?” The things we hear as children are usually the very things that create our sense of self. Early in life, sense of self is associated with security, protection, and acceptance. If our identity is strongly developed in the early years of life, this helps to protect us against the difficulties and challenges in our later years of life. Your boundaries, your world view and your self-esteem are all greatly and profoundly influenced by your sense of self. So, use this art therapy journal exercise to explore, re-discover and if necessary re-create your sense of self. Journaling provides a way for people to move through difficult feelings and worries to discover what makes us happy. Journaling can be used to discover gratitude and satisfaction in order to escape difficult emotions and moods. We can record positive emotions through art journaling when we are caught in a negative frame of mind. There is no better time than the present to start awakening to our true selves. When we awake to the truths that we have suppressed; perhaps in our attempts to fit in, we will want to commit to follow and explore our inner urges, our true selves in order to know ourselves and better understand our thoughts and our behaviors. Use this exercise to draw and paint something that elicits joy and contentment. Follow your inner promptings and use these promptings to guide you to your inner child, your true self. Find your authentic empowered femininity or masculinity, your own flavor of personal expression through the muscle of intuitive, spontaneous creativity. Creativity is a wonderful way to release old habits and beliefs that are holding you back. You can restructure and paint new beliefs into your schematic system that can modify deeply held maladaptive beliefs that perpetuate psychopathology. As you are journaling, paint an imaginal picture of the desired new way of being. (Imaginal means of or relating to the imagination) As you experience yourself feeling more creative, more confident in your abilities, and more focused on the way you are feeling in the present moment, ask yourself, “What kind of new rules or operating principles do I have in place?” What kind of basic beliefs do I have about myself and others?” “How is this new way of thinking different from before, from the old way of thinking?” Imagine you could be anyone and do anything you want to do with your life. How would you feel? Where would you be and what would you be doing? Bring your friends or family into the scene. What would they say to you? How would you feel in response to their participation? Paint a detailed description of your surroundings in which this event is taking place. How does it smell? What is the temperature? Focus on bodily feelings. What is happening in your body? What are you learning about yourself, or other people from this experience? When you are finished with this exercise, get as comfortable as you can and clear your mind by being in the present moment. Use your senses, hearing, touch, smell, etc. to notice exactly what is going on around you. Don’t try to analyze it, just observe it.